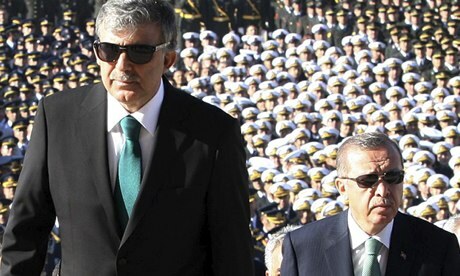 Gul not ruling out challenging authoritarian prime minister, Recep Tayyip Erdogan, for presidency next summer. Growing divergence of views over the government’s handling of last summer’s violent street protests, and over what Gul calls Turkey’s “democratic deficit” and the “normalisation” of Islamic values within Turkey’s secular constitutional framework, has prompted suggestions that the two men, who together have dominated the Turkish political scene for more than a decade, may soon turn on each other. The Turkish president, Abdullah Gul, has again hinted he is prepared to challenge the country’s authoritarian prime minister, Recep Tayyip Erdogan, in presidential elections next summer that could decide the increasingly vexed question of who runs Turkey. Asked during an exclusive weekend interview with the Guardian whether he would seek a second term, Gul said it was too early to make a decision. When pressed, he declined to rule out his candidacy, saying he was keeping “all options open”. Erdogan has served three consecutive terms as prime minister since 2003, during which time he transformed Turkey’s economy and its international standing but has been heavily criticised for perceived dictatorial tendencies. Under rules adopted by his neo-Islamist Justice and Development party (AK), Erdogan is barred from seeking a fourth term as an MP. But he has done little to discourage speculation that he may seek the presidency next year, when the winner will be elected for the first time by popular vote. Speaking in a television interview last month, Erdogan indicated he would stand for president if nominated. “Whatever duty my party burdens me with, whatever it wishes of me, I will endeavour to do it,” he said. Yet for Erdogan to achieve his aim, the popular Gul, a former foreign minister and political moderate who became president in 2007, would have to agree to voluntarily make way – and it is increasingly unclear whether he will. A job swap has also been floated, with Gul moving to the prime minister’s office while Erdogan takes on a presidency with enhanced powers, following the model created last year by Russia’s Vladimir Putin and the former president, Dmitri Medvedev. But a growing divergence of views over the government’s handling of last summer’s violent street protests, and over what Gul calls Turkey’s “democratic deficit” and the “normalisation” of Islamic values within Turkey’s secular constitutional framework, has prompted suggestions that the two men, who together have dominated the Turkish political scene for more than a decade, may soon turn on each other. Speaking to the Guardian, Gul insisted Erdogan was a friend, not a rival, and dismissed talk of policy rifts over his more inclusive stance on issues such as alcohol use and when Muslim women may wear the headscarf. “We established the ruling party together with Tayyip Erdogan, we’re the founders of the party. We took the party to government together and we changed Turkey together. “Erdogan is a friend and we have worked shoulder to shoulder with him in the course of all these years,” Gul said. But Gul reiterated his support for peaceful protests, for official investigations into police conduct, and for his view that Turkish society needed greater openness. All are positions opposed to varying degrees by Erdogan, who scorned the demonstrators as “riff-raff” and has offered only limited reforms to Kurds and other minority groups. “I always have openly expressed my views and I expressed them at the time of the [summer] demonstrations and in my inaugural speech to parliament [last month]. “There is a democratic deficit in Turkey, in other words we have a way to go in taking our standards and criteria further,” Gul said. Much had been achieved, but there was still more to do, he said, referring to his recent speech in Izmir when he called for a second generation of social and legal reforms. Opinion is divided over whether Gul will launch a serious challenge to Erdogan’s dominance. Some observers say that he is carefully positioning himself for a run at a second term, but others disagree. “Gul talks a lot but he does not do anything,” a leading Istanbul businesswoman and political insider said. This entry was posted in Essays, News and tagged Abdullah Gül, democratic deficit, Gezi protests, Political rivalry, Presidential elections, Tayyip Erdoğan on 3 November 2013 .